Leigh and Christine had a great time last Saturday making our fantastic Halloween Paper Wreath! We modeled it after one we saw on Pinterest from an Etsy shop named Paper Art Pleasantries by Sizerz. She has some of the most beautiful paper wreaths. We needed ours to be large enough to fit over our mantel and it took both girls several hours to put it together. My only contribution was the crepe paper ruffles, they did everything else. Didn't they do a fantastic job on it? We absolutely love it hanging on the mantel. It was very easy to make and only requires a few supplies - cardstock, tape, hot glue gun, white school glue, foam core (or cardboard circle), small piece of florist foam, an old book, and orange and black crepe paper. Start by cutting pages out of a book. Some are rolled and taped with a point and some are rolled and taped without a point. 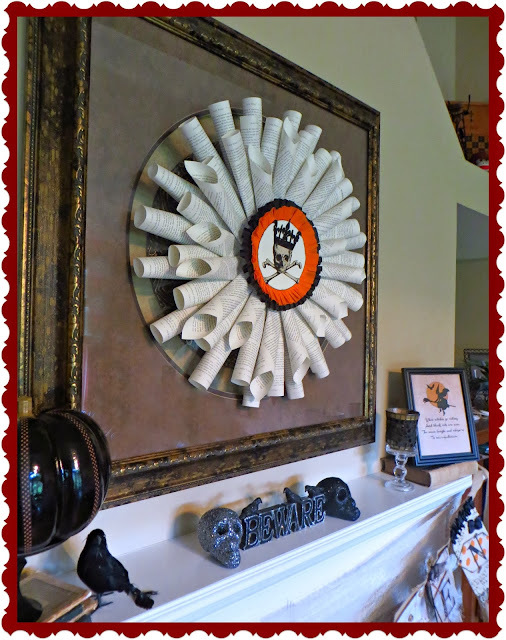 Using a hot glue gun, glue the rolled paper tubes on to a large foam core (or cardboard) circle. 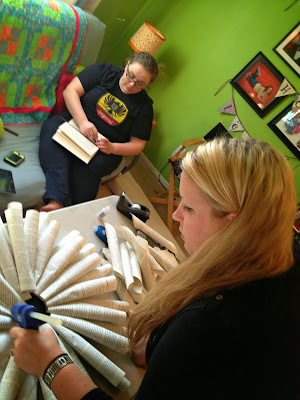 Look at that teamwork - Leigh is cutting book pages and Christine is gluing. 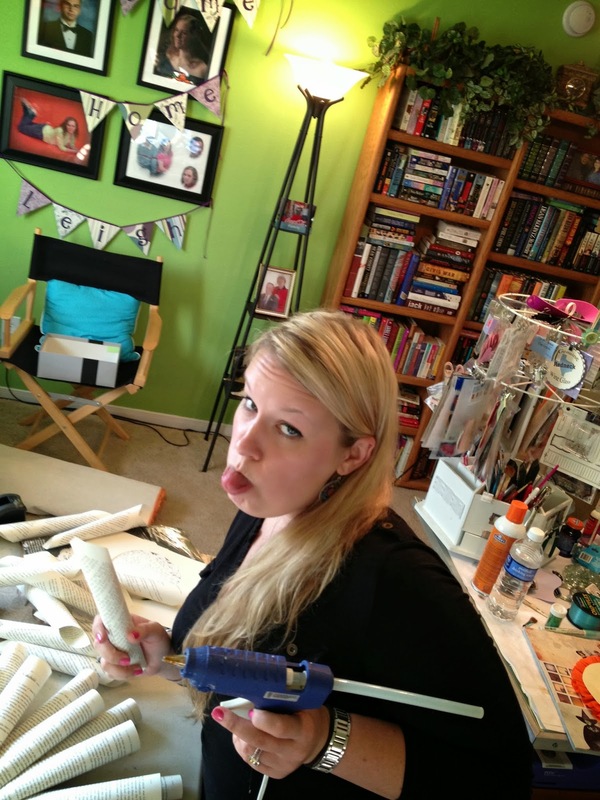 Then stop to strike a pose for the camera hound, all while artfully holding the glue gun and a paper tube!!! 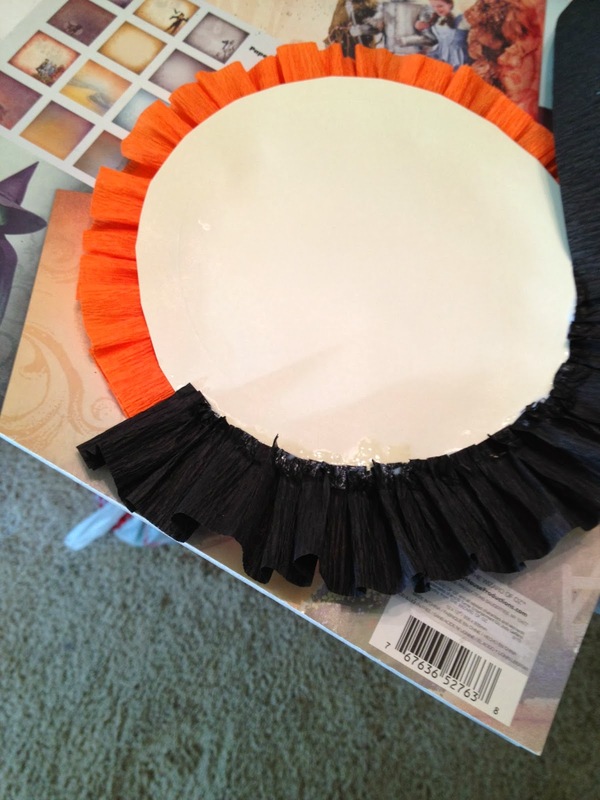 On to the crepe paper ruffles - start with the orange and glue it on to a paper circle with white school glue. 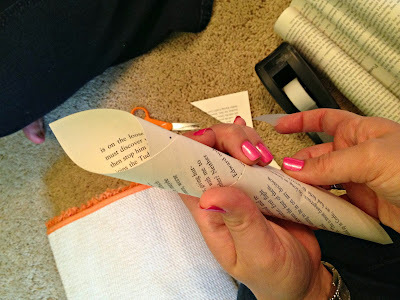 Pleat the paper as you glue it down. Once you have the orange ruffle complete, cut a slightly larger paper circle and glue it on to the the back of the orange ruffle. This will give you a base to attach the black ruffle to. 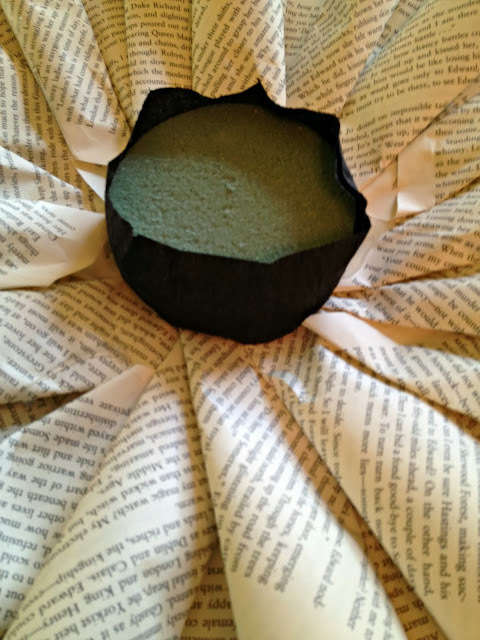 Glue the black crepe paper to the circle with white school glue and pleat it as you go. After the black ruffle is complete cut out another paper circle and glue it on to the back to cover the edge of the black ruffle. This will make it more stable and will protect the crepe paper. 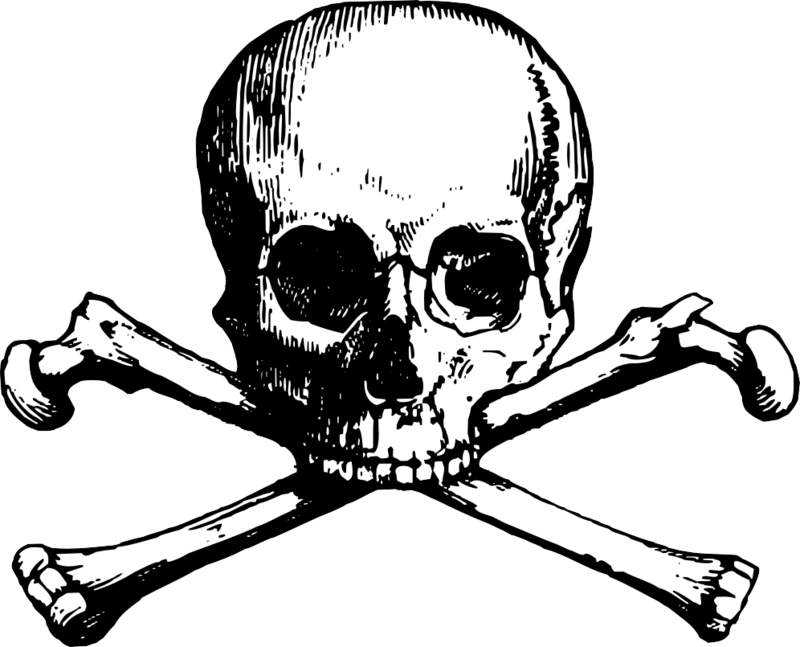 We printed the skull and crossbones out on ecru cardstock, and Leigh cut it out. The crown we used was a Cricut diecut that was sprayed with spray glue and glittered. There are lots of crown images on the web, so I'm sure you could find one and cut it out to use. Right click on the skull image and save it to your computer to use for your own wreath or Halloween decorations. We also used it on our Halloween Banner. Leigh cut 3 of these out for us - poor thing! 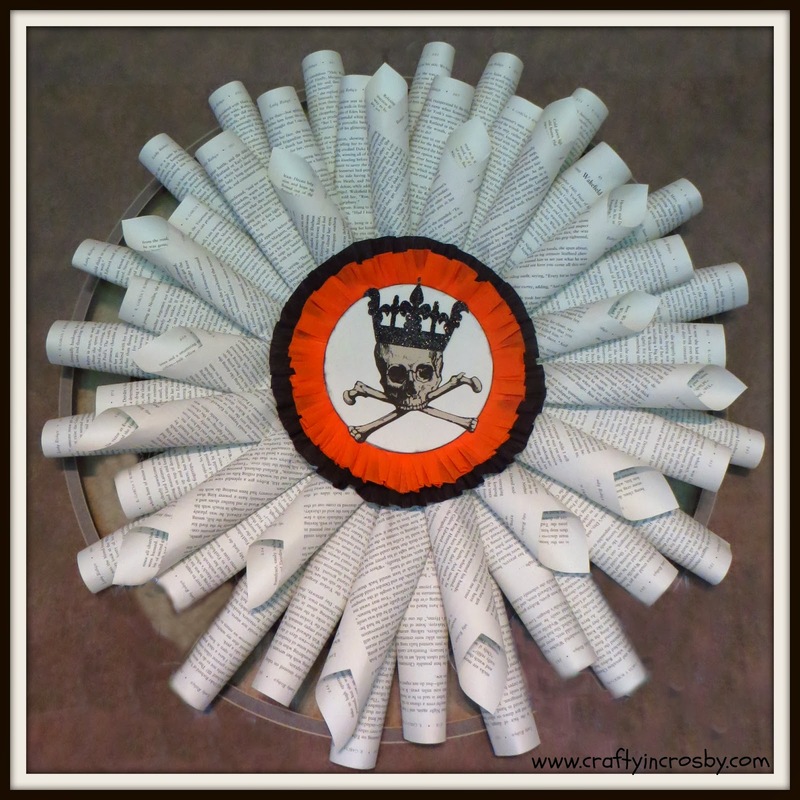 The skull and crown was glued on to a cardstock circle that had inked edges. I've just gotten to where I hate raw paper edges. It's a sickness, I know, but I can't seem to stop. Now Leigh has the sickness too!!! Once the wreath was complete we needed to raise up the center medallion. So we cut a small section from a round piece of florist foam and hot glued it to the foam core. I think it came from Dollar Tree. We wanted to make sure that the green wouldn't show from behind the medallion, so we wrapped a piece of black crepe paper around the edge. Then the medallion was glued on top of the foam, and with the addition of a paper clip hanger on the back, the wreath was complete!!! I was the perfect addition to 2013's Halloween Mantel!!! Thanks so much to Leigh and Christine for crafting up a masterpiece. Leigh's Dad says it is our new family crest! Smartypants! Hope everyone had a wonderful and relaxing weekend! Come back soon for more Halloween 2013 projects! Love how it turned out! I'd love you to share it at the party @DearCreatives if you like. Hope you have a great weekend. Thanks so much Theresa! We linked up - thanks for the invite! The girls did a great job! Love the witch legs in the chimney and the banner. We just love Halloween - as you can tell! They did a fantastic job! I'm so proud that my girls got the crafting gene! One is my girl by birth and the other is what we fondly refer to as our Non-Daughter! She calls us her Non-Parents! Hi and yes the girls did a great job with the decorations! I really need to get out all of mine and get started! I am laughing at hubby's remark. Lol. Take care and have a nice week. He thinks he's a comedian!! Thanks for dropping by Julie! Thanks so much Kayla - we linked up! I love the witch's feet hanging out of the fireplace! You guys are so crafty. We just love Halloween!!! She says with an evil witch cackle!!! Thanks for the invite - we linked up! I just love the whole look of your mantle! It all came out great! That is so cool, tell the girls they did an awesome job! Who thought of the witch in the fireplace? I am doing this. Thank you for sharing it on our Four Seasons Blog Hop. Oh and my sister, the pin it junkie, just pinned it. Thanks Shawna. I wish I could say that the Fireplace Witch was an original idea, but I saw it on Pinterest. I think the original pin was from BH&G. We made ours with thrift store boots, a pool noodle, stockings, a little tulle for the skirt and a bit of wire. It just makes me smile every time I walk past it. Tell your sister thanks for the support! This turned out great! I love how you hung it inside a frame. I found your link on A Vision to Remember link party. Thanks for stopping by Katie! Hope you have a wonderful week! Thanks for the invite Tammy - we linked up. We love our Halloween mantel this year. 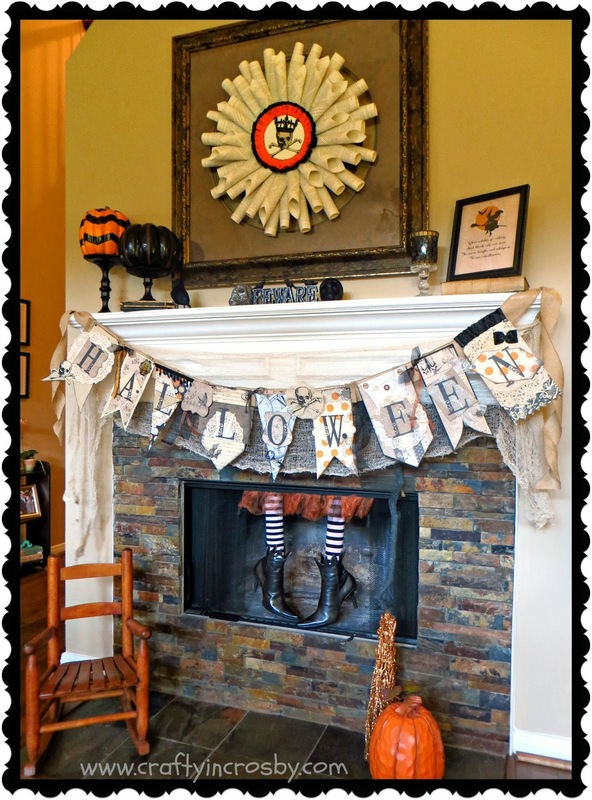 The Fireplace Witch is from last year, but the banner and the paper wreath are new additions. We just love Halloween - can you tell? I love this wreath! Thank you so much for sharing at A Bouquet of Talent this week. Just featured it at Pick of the Bunch! Wow Kathy! We are so honored! I'm so proud of my girls for making this beautiful wreath! It just looks amazing hanging about the mantel! You made this a fantastic Saturday out in Crosby! Stopping by to let you know I'm featuring you this Friday on my Spooktacular Linky Features! 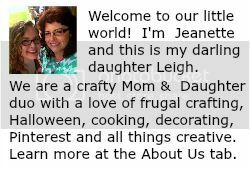 Thanks so much for sharing on Made in a Day! Thank you so much Kim! Can't wait to see it! 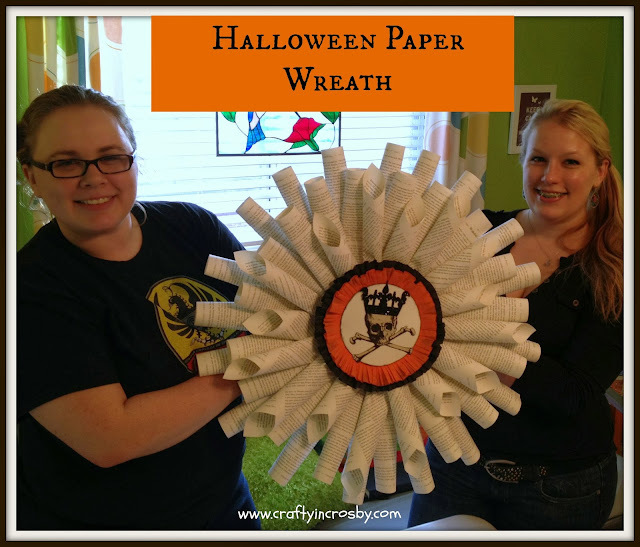 Stopping by to let you know I am featuring your wreath today on my Spooktacular Features #3! Thanks so much for linking up!